Bell's new tamper-resistant PROTECTA "SIDEWINDER" Bait Station (Clear Lid) is the most versatile and time efficient station available. It opens to the side, like a book, and that ensures full, unrestricted inside access. rounded interior walls for quick clean-ups. A durable, removable insert also makes clean-ups quicker. 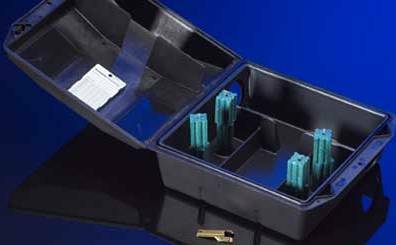 Bait securing rods, full-size insert and service card are included with each station. An plastic service card slot is built into cover making documentation tasks easier. Bell's existing RTU/LP key provides access to the new station. Like the full line of PROTECTA Bait Stations, PROTECTA SIDEWINDER continues Bell's focus on quality, safety and versatility.